The central question at the heart of MURDER AT THE HOUSE OF ROOSTER HAPPINESS is whether or not there is a dedicated, husband-killer stalking a certain kind of man in Chiang Mai, a city in northern Thailand. The unlikely team of people who become interested in this case includes the local hospital’s nurse ethicist, Ladarat Patalung, her cousin who runs a local brothel and Wiriyai Mookja, a decorated local police detective who is unwilling to use more traditional techniques at the outset of this unorthodox investigation. At the same time as she is drawn into her first ever case as a detective, Ladarat must continue to perform her regular duties which include preparing for an impending Royal Inspection of the hospital and seeing to the many issues requiring the application of her skills as an ethicist that arise on a daily basis. Most notably there is the troubling situation of dealing with the family of a young American patient who is thought to be brain dead. Although David Casarett is not Thai he is a medical doctor who has clearly spent time in the country and not only as a tourist. There is an authentic feel to the book, in particular its insights into modern Thai medicine, but the reverence Casarett clearly feels for the culture is not of a sycophantic level. In fact I was quite surprised to see several Good Reads reviews complaining about the ‘America bashing’ in the book because I thought one of the things it did well in its highlighting of the differences in the two cultures was to show strengths and weaknesses of both. I am perhaps more interested than the average person in the field of applied ethics but I really loved the way Casarett has woven this into the story in a realistic but comprehensible way. This added a layer of distinctiveness to the novel which it probably needs given the undeniable similarities between this and Alexander McCall Smith’s No. 1 Ladies Detective Agency series. The Thai setting is another particular feature, and it goes well beyond the mouth-watering food that Ladarat picks up each night from the vendor at the end of her street. The book is definitely one for virtual travellers. 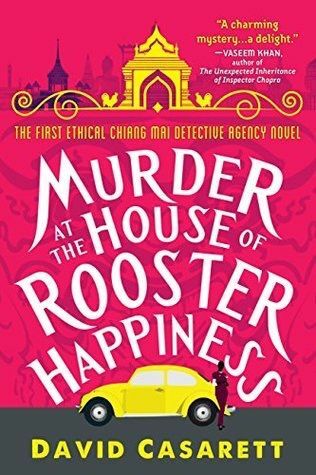 MURDER AT THE HOUSE OF ROOSTER HAPPINESS is definitely at the cosier end of the crime fiction spectrum but should not be easily dismissed because of that. It offers a genuine glimpse into the culture it depicts and while its characters do not wield guns or encounter blood-dripping corpses they do deal with many of life’s struggles. These include the amusing – such as the seemingly world-wide plague that is bureaucracy – to the difficult ethical issues that modern living throws at us all from time to time including a unique take on prostitution. I thoroughly enjoyed meeting Ladarat, her cousin and the detective and will definitely be looking to visit with them again soon. This entry was posted in book review, David Casarett, Thailand. Bookmark the permalink. This sounds really interesting, Bernadette. The setting is appealing, and the set of ethics questions are interesting, too. I like it very much when an author can capture a sense of a place, and it sounds as though that happens here. Glad you enjoyed it. Sounds interesting. Any book compared to Precious Ramotswe’s series is going on my list. And Thailand, ethics, a woman character, yep. The Thai background and the ethical slant on things are intriguing, especially as, from your review, it sounds as though these aren’t just gimmicky add-ons. Thanks for the review, I will keep an eye out for this one at the library. The ethical side of things is really the heart of the book – it made more sense after I’d finished and googled the author and realised he is a doctor and has written non-fiction about those kinds of issues.